Camper life is the ultimate example of tiny living. Whether you live in an RV, a van, or a 5th Wheel, camper life is about making the most of a small space. Sharing that small space with your partner can be challenging! We have discovered a number of important tips for staying happy in a small space as a couple. This may seem obvious, but when you share a small space with your partner it is easy to get on each other’s nerves. If your partner is irritating you keep in mind that the irritation you feel is your issue, not theirs. Before you make a passive aggressive comment or express your irritation, stop to think for a moment about whether this issue justifies treating your partner unkindly. Chances are it’s a momentary annoyance that can be ignored. It’s also VERY likely that your partner is only annoying you because you are tired, hungry, stressed…..you see my point. Just like any other behavior, choosing to ignore small annoyances will become a habit over time, and your relationship will be happier and stronger for it. Developing healthy relationship habits is SO important when you share a camper. And keep in mind that couples who travel together stay together, so don't sweat the small stuff! Okay, I know this may sound cheesy, but positive touch works wonders in a relationship. Positive touch can be anything from holding hands to laying on the couch snuggling. Positive touch causes our brains to release chemicals like seratonin and oxytocin, which make us feel calm, happy, and encourage bonding. Positive touch also acts as a form of non-verbal communication between you and your partner. It’s a way to say I love you without using words, and it can actually be more powerful than words. Tom and I try to make time for positive touch every morning and every evening, and on days when we aren’t able to we can feel a difference in our mood! We are less calm, and often grouchier if we have not had a chance to snuggle. Cheesy? probably. Effective? ABSOLUTELY. After moving into a small space you will quickly discover your personal "small space deal breakers" (they are inevitable when you share a camper). These are conditions that will absolutely drive you BONKERS. For example, I cannot stand it if dirty dishes are left out on the table or counter in our camper. It makes me irrationally angry. Tom, on the other hand, becomes seriously irritated if the dog is under his feet when he’s trying to walk around in the camper. When we first moved into the camper we would bicker over these issues until it dawned on us that we should just eliminate them! Now we have a wash basin for dirty dishes that sits hidden away in the shower until we have time to actually wash them, and we trained Indy to jump up off the floor and onto the RV couch on command so that if he is in Tom’s way we can quickly and easily move him elsewhere. Camper life tends to amplify emotions. The good times are GREAT, and most of the time we are incredibly happy. However, bad days happen just like they do in a stationary life, and the bad days tend to feel really bad. I suspect this has to do with the small space and the added stressors of living in a camper. Whatever the reason, try to understand that both you and your partner will have bad days from time to time, and that those bad days may cause you to feel irritable and grouchy. When your partner is having a bad day work extra hard to practice our first tip- be kind! Bad days are contagious in a small space, so to avoid picking up your partner’s mood put extra effort into being kind. 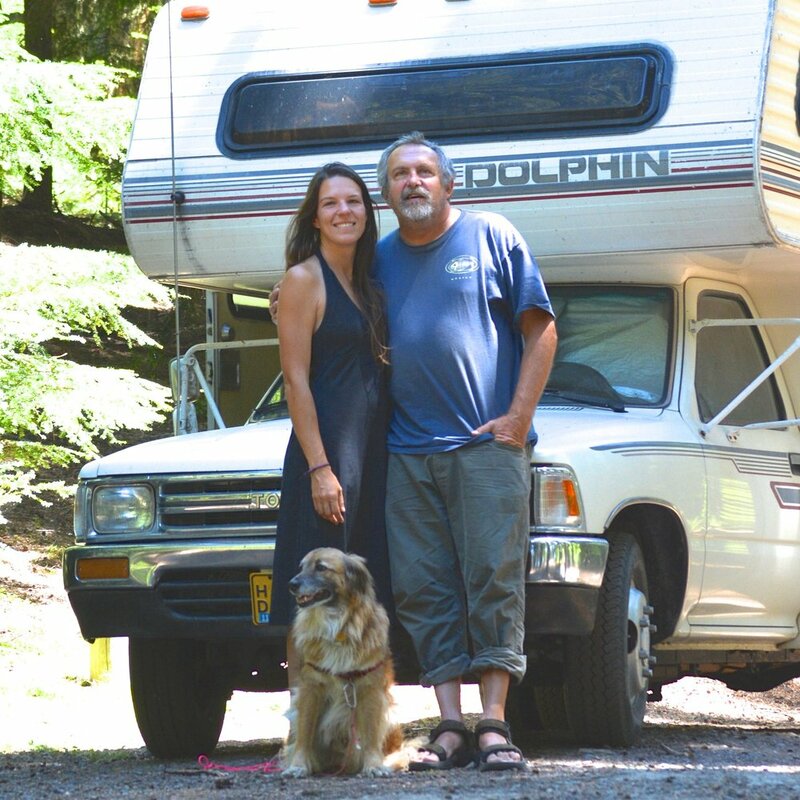 The thing that makes camper life unique from tiny house living, or other small living arrangements is that most campers travel frequently. For couples this means that you are not only sharing a small space, but you are always together. Tom and I recently calculated that, aside from a few weeks this summer, we have not been apart for more than a few minutes for the last year. That is a LOT of together time, and in order to make it work it is essential to be open with each other about how you’re feeling. Are there issues we need to address? What are some things that are going really well? During these conversations it’s essential to actively listen to your partner’s feelings, and try to accept them without becoming defensive. These conversations allow us to peacefully work through issues as they arise, and before they have festered into all-out problems. Laughter is an essential tool when sharing a small space. We try not to take anything too seriously. Our roof is leaking at 3am? We can't find a camping spot after two hours of searching? We're lost on a forest road with absolutely zero reception? When things go wrong the best thing to do is laugh them off. All of these scenarios actually happened, and every time we had the option of getting upset OR laughing about it. Don't get me wrong, we weren't HAPPY about any of this stuff, but we made the best of it, and now we have so many stories of our camper life FAILS haha. Seriously, make each other laugh as often as possible. Laughter is incredibly therapeutic, and (much like positive touch) it releases happy chemicals that encourage bonding! It took some bumps in the road for us to figure out how to happily share a small space as a couple. Hopefully our tips will help you skip the bumps and set a solid foundation for your travels as a couple! For more advice on couple's travel check out the 10 things NOT to do when traveling as a couple. Want to read more about our camper life adventures? Check out 10 reasons we fell in love with camper life. Considering camper life or camper travel? Be sure you have everything you need for your trip! Curious about Burning Man? Read about the time I went to Burning Man alone!